Make a delicious strawberry cream pie. Photo courtesy California Milk Advisory Board. 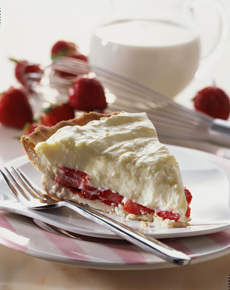 Today is National Strawberry Cream Pie Day. A cream pie is a plain pastry or crumb pastry shell with a pudding or pudding-like filling. Butterscotch, chocolate, frangipane and vanilla are most common, as are banana cream pie, coconut cream pie, strawberry or raspberry cream pie. And celebrate the day by making this delicious strawberry cream pie recipe, courtesy of the California Milk Advisory Board. 2. MIX the flour and powdered sugar together. Add the butter. Mix together and press mixture into a 9-inch deep dish pie plate. Bake 12 to 15 minutes or until lightly browned then let cool. 3. COMBINE the sugar, salt and cornstarch in medium size saucepan. Slowly whisk in the milk until smooth. Cook over medium heat until thick, stirring constantly. Boil 1 minute then remove from heat. 4. STIR a small amount of the hot mixture into the beaten egg yolks. Pour back into the pan and cook for 2 minutes more without letting the mixture boil. Remove from heat and stir in vanilla; fold in sour cream. Cover and cool to lukewarm. 5. LINE the pie shell with sliced strawberries and pour the filling over the berries. Chill well before cutting into wedges. Makes 8 servings. Also check out this raspberry cream pie recipe (National Raspberry Cream Pie Day is August 1st). Yummy strawberries are available almost everywhere. 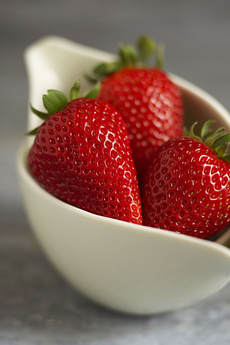 Photo courtesy California Strawberry Commission. See many more delicious recipes from the California Milk Advisory Board.